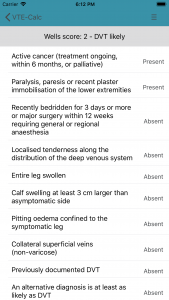 Suspected pulmonary embolus and deep vein thrombosis are some of the most frequent acute medical presentations. VTE Calc puts the most commonly used VTE calculators in the palm of you hand to ensure you come up with the correct answer quickly. 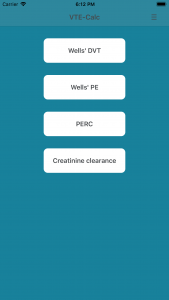 It includes Wells’ scores for DVT and PE, the PERC score and a creatinine clearance calculator. The app is supported by advertising but this can be removed with an in-app purchase. Simply select the calculator you need from the home screen. Data entry is kept to a minimum. Simply tap the items to select those that are present. The score at the top of the screen is instantly updated as you progress through the items. 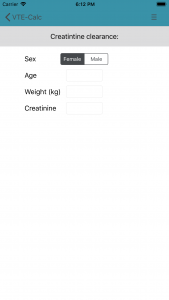 The creatine clearance calculator use the Cockcroft-Gault method. In many circumstances you will need to prescribe a low molecular heparin as soon as the diagnosis is suspected. The calculator helps you do this quickly and easily, avoiding errors that might creep in if you use a calculator.